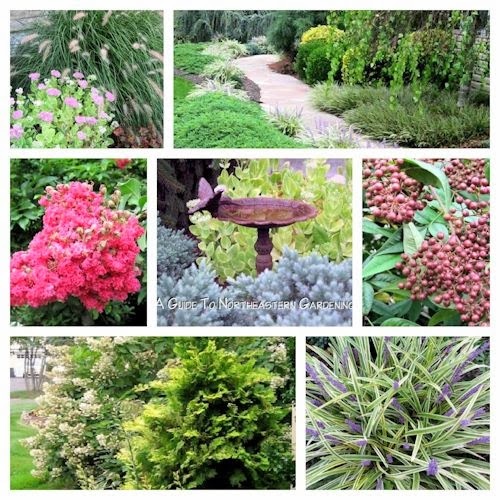 In some cases landscape design calls for plantings which are more "drought tolerant". Plants defined as 'drought tolerant" require watering until established and then can survive on minimal water from natural rainwater and occasional irrigation in hotter climates. The goal is to create a space which is both aesthetically pleasing and low maintenance at the same time. 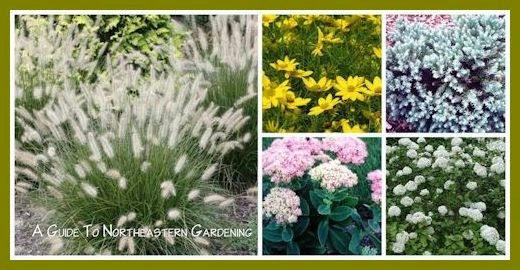 In this article I am going to focus on "drought tolerant" selections that I have found to be most productive here on Long Island (Zone 7) and that are hardy in a range of zones from 3-9. The first in a line of drought tolerant perennials is Coreopsis 'Zagreb'. This daisy-like flower grows on fine stalks and displays yellow blooms from June until late September. 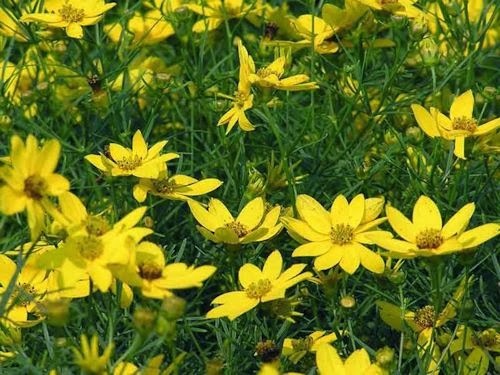 Coreopsis grows to approximately 15 inches in height and prefers a well-drained, slightly acidic soil and full sun. Next is Sedum 'Aurea'. 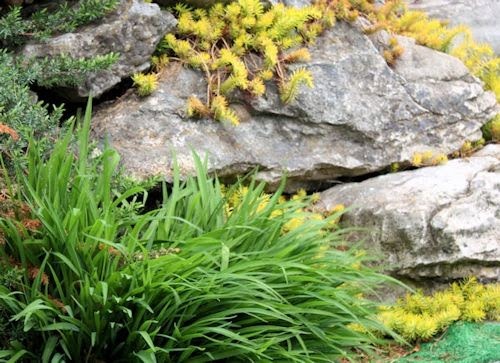 Sedum is very drought tolerant and serves nicely in rock gardens as seen here. It is accompanied by Daylily 'Stella D' Oro', which is drought tolerant once established. Sedum 'Aurea' only grows to approximately 4 inches in height while 'Stella D Oro' grows to 12-18 inches in height. Both prefer a well-drained soil and full sun. Gaillardia or Blanket Flower is known for its drought tolerance and display of vibrant yellow-red blooms lasting from June until August. Gaillardia grows to a height of 12-15 inches and prefers a slightly acidic, well -drained dry soil in full sun. Here on Long Island I have found Gaillardia to be reliable once established but not as long lived as the other perennials mentioned (average lifespan three to four years). 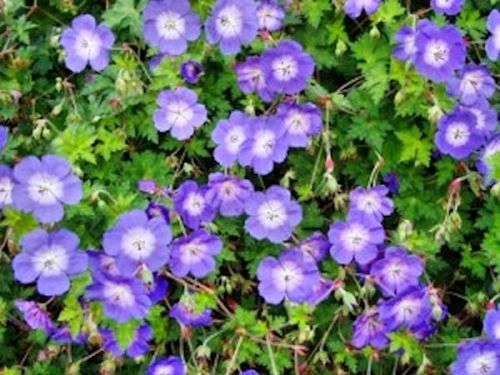 Perennial Geranium tolerates a variety of conditions (full sun to partial shade) and displays violet blue flowers from June until frost and grows to a height of approximately 15-18 inches. Once established it seems to thrive on neglect. Rudbeckia is another drought tolerant perennial that seems to thrive on neglect. Plant it in an area where there is plenty of space. 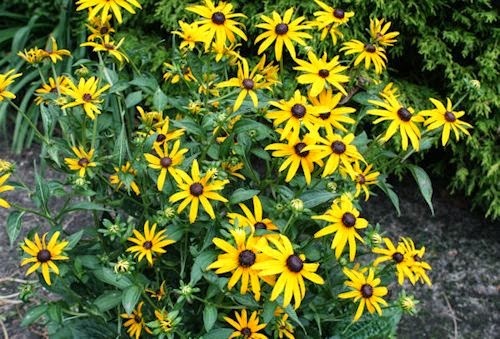 Rudbeckia is perfect for informal mass plantings such as along and woodland border and prefer full sun to partial shade and a well-drained slightly acidic soil. Rudbeckia will re-seed themselves and spread quickly. Bloom time is from late summer into fall. ﻿﻿ Nepeta is available in a number of heights ranging from 18-36 inches and is very hardy to zones 3-8. It displays lavender-blue flowers from June to fall. For smaller spaces, 'Walkers Low' is a newer variety only growing 12-18 inches tall. Nepeta thrives in a range of conditions, prefers full sun to partial shade and is drought tolerant. Sedum forms clumps of orange-pink flowers on large heads in late summer into fall and require little watering. The variety shown here is Sedum 'Brilliant', a more compact variety that grows to approximately 12-18 inches tall. Sedum is complemented nicely by ornamental grasses. Barberry is a deciduous drought tolerant shrub with deep burgundy foliage that lasts from spring into fall. There are many varieties of Barberry ranging from 'Royal Burgundy' which grows to 2-3 feet in height to 'Rosy Glow' (shown above) that reaches to 5-6 feet. 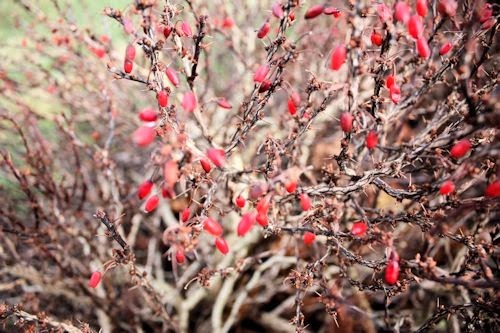 Barberry requires full direct sun and a slightly acidic, well drained soil. 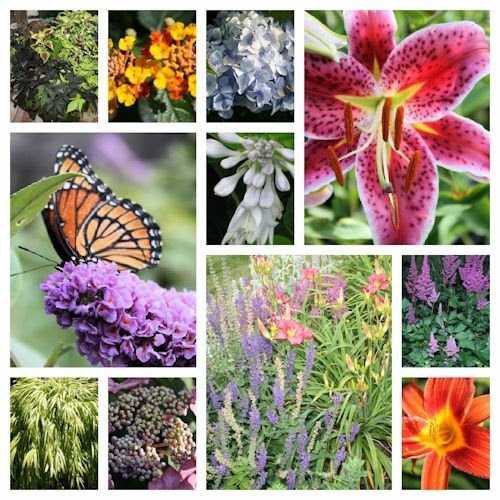 It is nicely complemented by some of the perennials listed here such as Coreopsis and Nepeta. *Update (2015): Barberry has been labeled as invasive in some states. 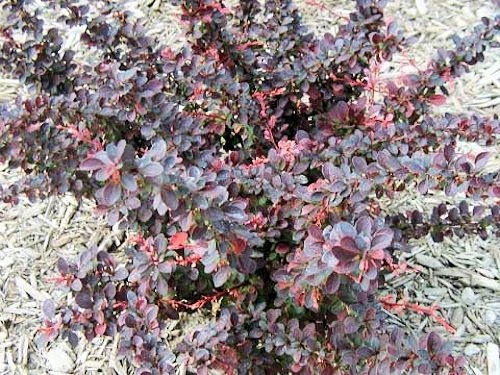 Alternatives for dwarf barberry are Dwarf Weigelia 'Spilled Wine', 'Wine and Roses', 'Midnight Wine', 'Dark Horse' or Fine Wine. Alternatives for regular sized Barberry are Eastern Ninebark (Physocarpus opulifolius) 'Summer Wine' or 'Diablo' or Smoke bush (Cotinus coggygria). Ornamental grasses add movement and grace to any landscape. 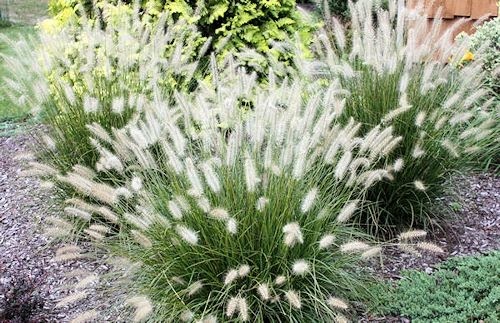 Ranging in a number of varieties and sizes, fountain grasses are hardy to a range of zones from 5-9 and prefer full sun and a dry, well-drained soil. 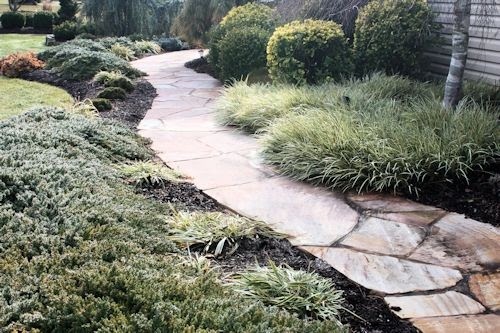 Grasses are often used in xeriscaping, requiring little irrigation. Juniperus 'Blue Star' is a beautiful blue-green evergreen that thrives in a slightly-acidic, well drained soil. Once established it requires little to no watering and it serves nicely in either a formal or informal garden. 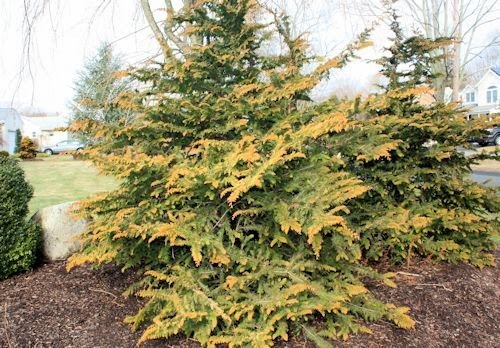 This small juniper grows to a mature height and width of 2-3 feet. 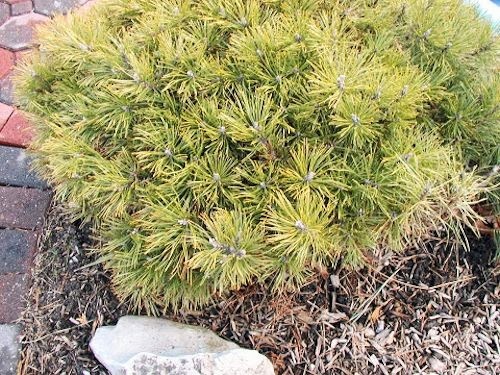 Mugo Pine is another evergreen that stays relatively compact (mature height and width of approximately 3 feet) and thrives in a slightly acidic, well drained, dry soil. It is drought tolerant once established and serves nicely in a rock garden planting. 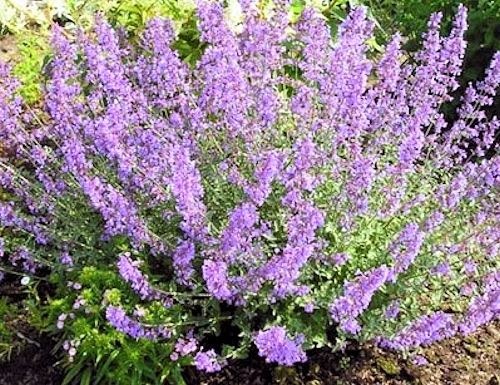 Other "drought tolerant" plantings not mentioned above include Spirea 'Vanhoutte' (Bridal Wreath), Buddleia (Butterfly Bush),Vibernum 'Carlesii', Lilac, Lavender, Liatris, Stachys (Lamb's Ear), Yarrow, Salvia, and Russian Sage. 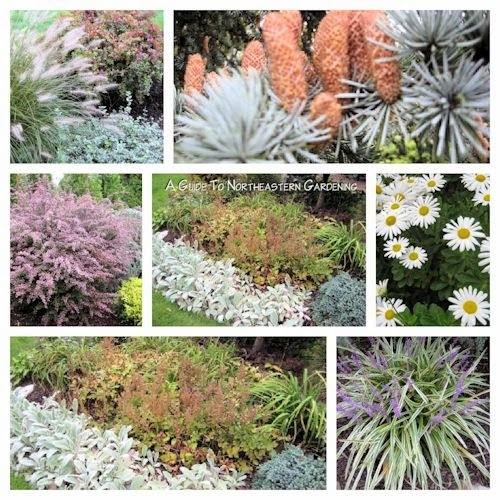 With the movement towards sustainable landscaping these drought tolerant varieties are colorful and low maintenance additions to either the residential or commercial garden. 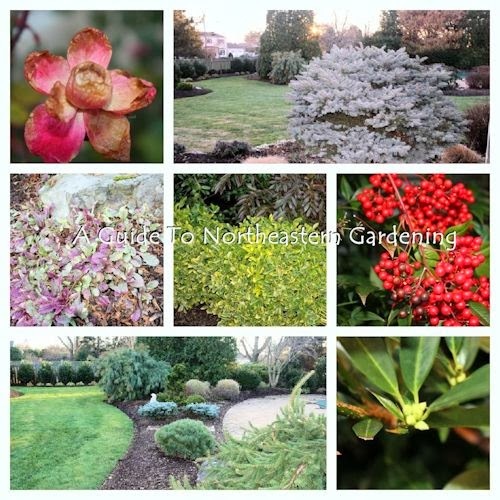 It's January in this Long Island garden and time for another Garden Blogger's Bloom Day. 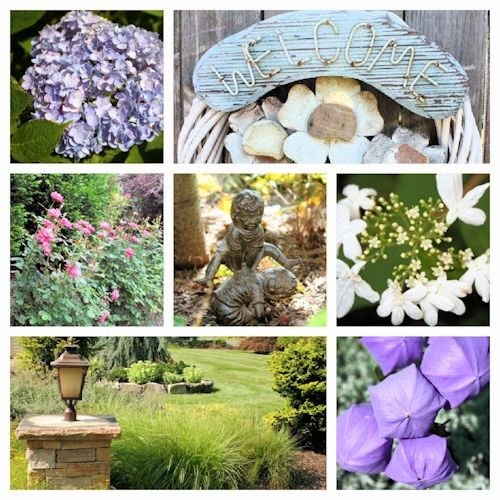 Inspired by the quote, “We can have flowers nearly every month of the year.” by Elizabeth Lawrence, Carol at May Dreams Gardens hosts Garden Blogger's Bloom Day on the 15th of every month. Gardeners from all over the world walk out into their gardens to note what is currently blooming. Blooms are few this time of year here in the northeast but I was able to venture out into my garden and find some colorful sites to share. The winter so far has been mild with temperatures in the 40's and 50's by day and 30's by night. We had just a slight dusting of snow so far around the holidays. Come with me and let's take a look. No need to bundle up...it's mild outside plus this is a virtual tour! The first plant to visit is my Nandina domestica. 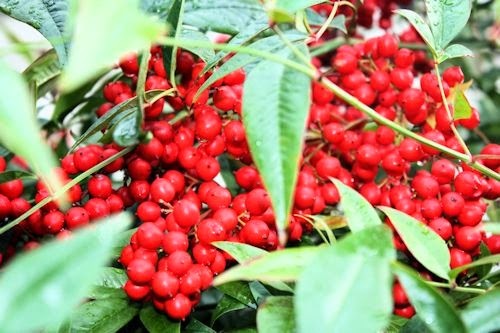 It displays its bright red berries all throughout the winter months. Along the winding walkway in the front are Japanese Garden Juniper, Liriope and Sedges which are the winter stables in the garden. Here is some Sedum groundcover peeking out in the back garden area. 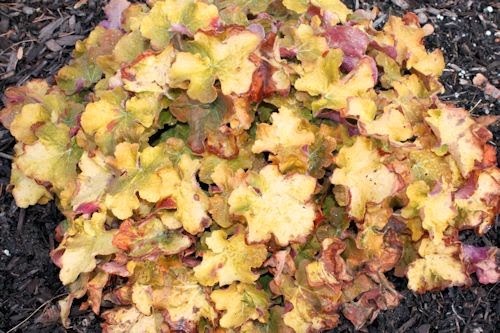 This Heuchera 'Caramel' just added to the garden during the past couple of years has proven to add some nice winter interest. Here is Barberry showing its red winter berries. 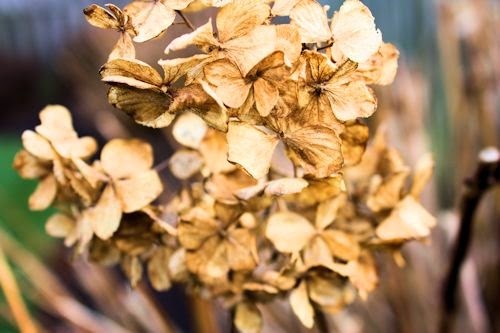 I love Hydrangeas and they even supply interest in wintertime with their dried flower heads. 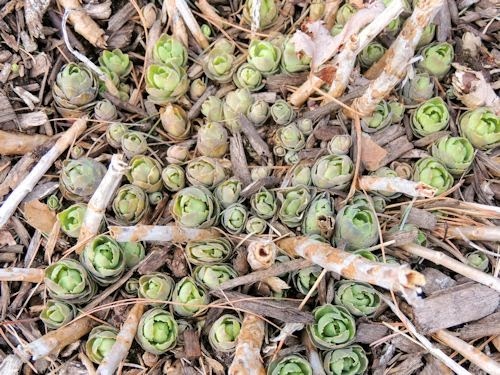 ﻿﻿ and some Sedum buds poking their heads up out of the soil in anticipation of spring. Viewed here are some more of the newly added Heuchera along with a Weeping Norway Spruce. The pool is all closed for the winter months but we can still enjoy the poolscape here with an assortment of evergreens. 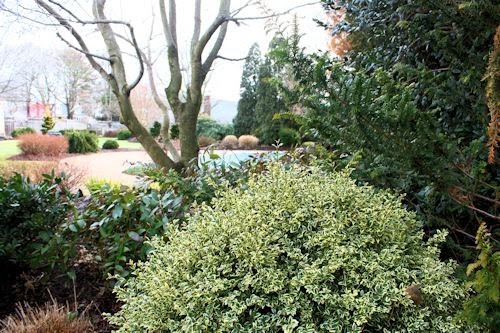 The most forefront plant is a Variegated Boxwood with some Nellie Stevens Holly in the right backdrop. 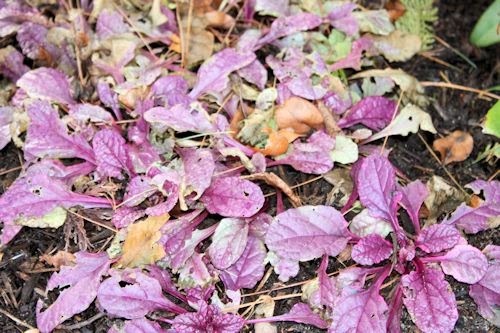 Ajuga 'Burgundy Glow' keeps it purple color all winter. 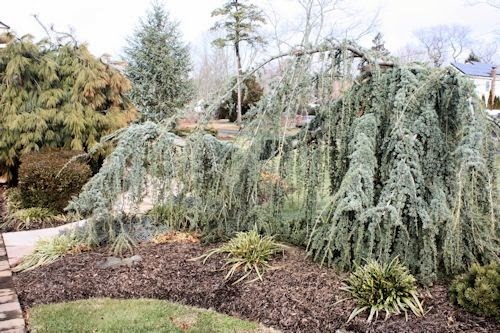 The Weeping Blue Atlas Cedar is one of my favorites any time of year with its cascading "waterfall-like" appearance and blue-green foliage. To the left is a Weeping White Pine and an upright Blue Atlas Cedar in the far backdrop. 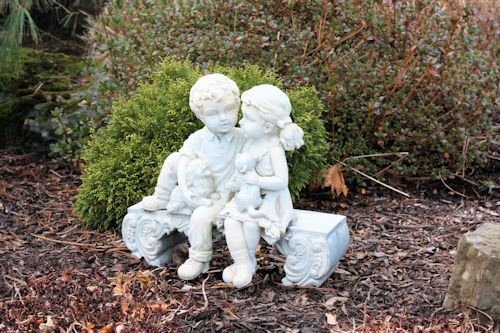 Garden gal and boy wait for spring to arrive in a few months. 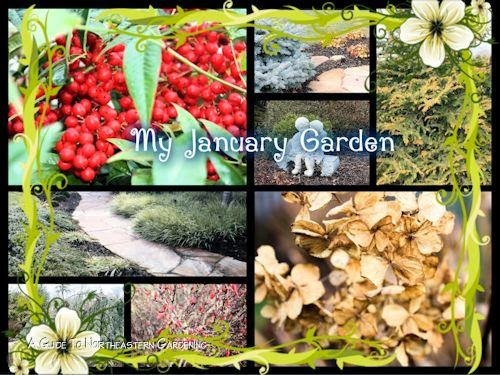 Thank you for taking time to stop by and visit my January garden...please let me know you were here...and please visit our hostess Carol at May Dreams Gardens for links to more gardens around the world. 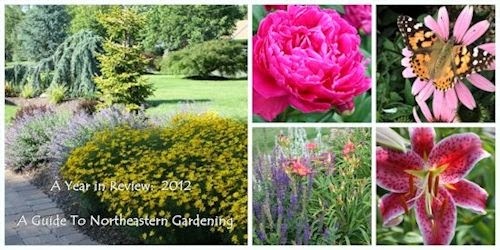 Overall 2012 was a good year here in my zone 7 Long Island garden. 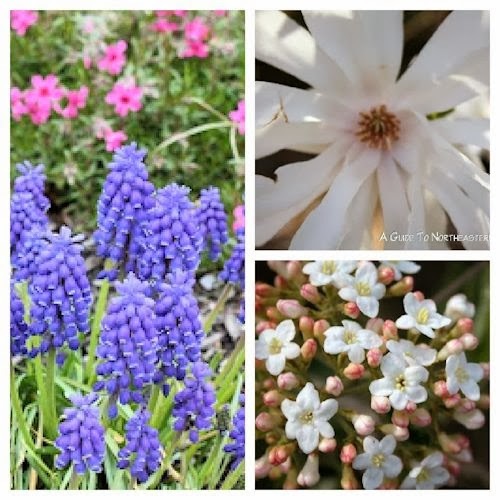 We started off with a virtually snow less winter with the exception of one storm, followed by an early spring with warmer than normal temperatures which caused the gardens to spark a little earlier that usual. The summer temperatures were moderate (in the 80's) with just enough rainfall to keep the blooms coming. In October we were hit unexpectedly by Hurricane Sandy which did quite a bit of damage to many of the evergreens but I think they will recover for the most part. Winter came in like a lion with frigid temperatures and winds. We are expected to have a snowy winter of 2013 but time will tell. Many new additions were brought to the garden this year including more Knock Out Roses, the new 'Caramel' Heuchera, Dwarf White Pine and Cyptomeria, Fire & Ice Hosta and some new crocus bulbs for the spring! Here is the year in review. 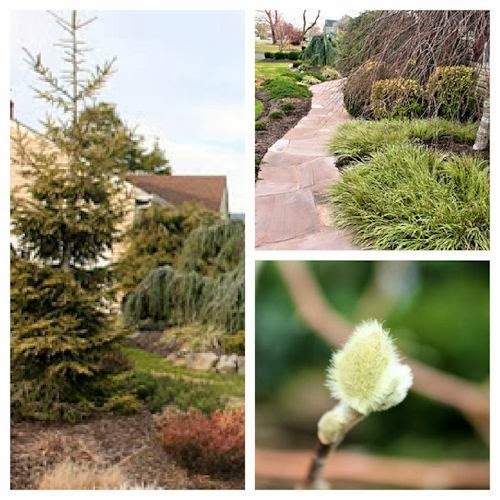 Here in January is Golden Oriental Spruce (left) and Weeping 'Youngi' Birch and Golden Japanese Sedge along the front walk (Right) and a Magnolia Bud (Below). As you can see January is pretty quiet around here so I rely on the evergreens for color and structure in the garden. The Coral Bark Maple (Sangu Kaku) bark is very vivid during the winter months with the appearance of red coral; hence the name. On the right is a combination of Ajuga and Sedge and below is Stachys (Lambs Ear). 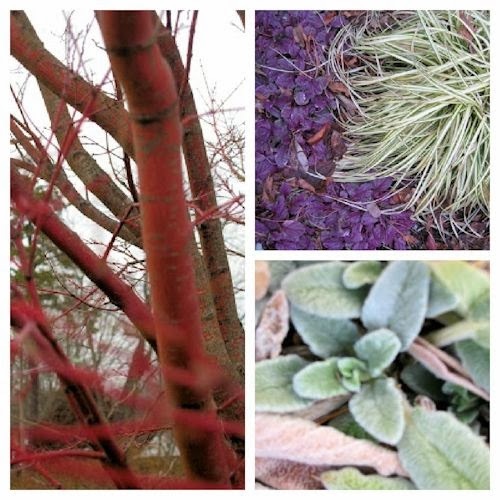 These elements present some color in the garden during February. 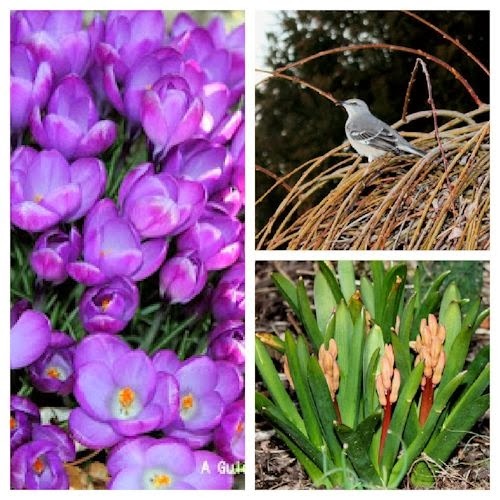 In March there are signs of spring in the air with crocus and Hyacinth blooms and a Mockingbird preparing its nest. March came in like a lamb with mild weather and out like a lion with high winds this past year. In April the grape hyacinths emerge and Magnolia 'Royal Star' (top right) is in full bloom...love the fragrance! Vibernum (lower right) is displaying its pink and white fragrant blooms as well. 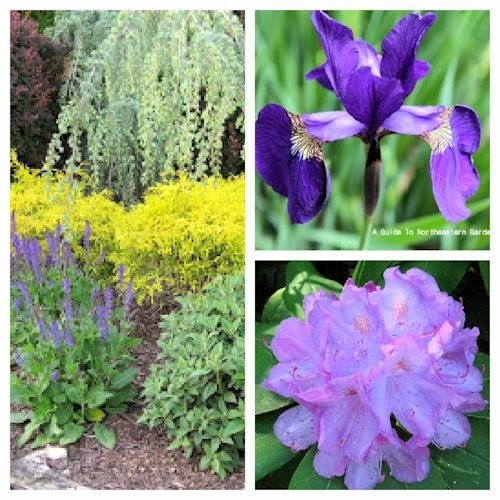 May is a busy month with purple Salvia 'May Night' (left), Japanese Iris and Rhododendron (right) in full bloom and Nepeta blooms (left) on the way. Love all the purples and lavenders at this time of year. June is busting out all over! 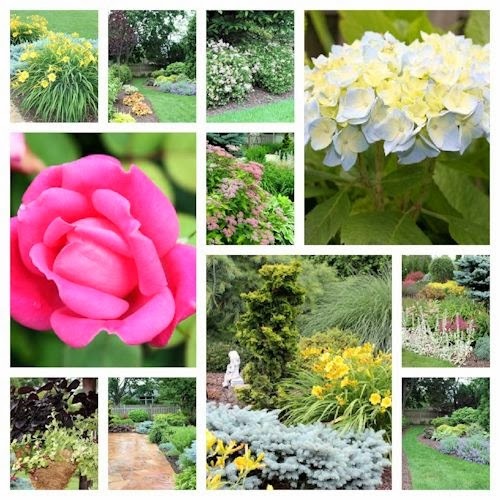 On Long Island June is the height of our gardening season with most plants at their peak. Knock Out Roses, Stella D' Oro Daylily, Spirea, Nepeta, Coreopsis, Astilbe and Lambs Ear are in full bloom. 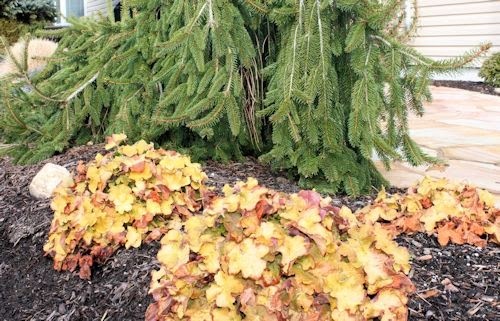 Evergreens are loaded with new brilliant growth and Heuchera is displaying beautiful shades of burgundy, lime and caramel. Hydrangea are starting to display their lovely blossoms. Everywhere you look the gardens are coming alive...love June! July brings the fragrant blooms of Butterfly Bush (left) and Lillium 'Stargazer' (upper right)along with Endless Summer Hydrangea, Vibernum 'Summer Snowflake', more Salvia and Astilbe. Patio planters of Lantana and Coleus are displaying their blooms as well. The butterflies arrive to see all the attractions. The August garden displays Platycodon (Balloon Flower) with its purple-blue blooms and Hydrangea are at their peak. Vibernum and Roses are blooming as well and grasses are full and adding movement to the garden. Crape Myrtle are starting to bud. Welcome November with its bright and beautiful colors of fall. 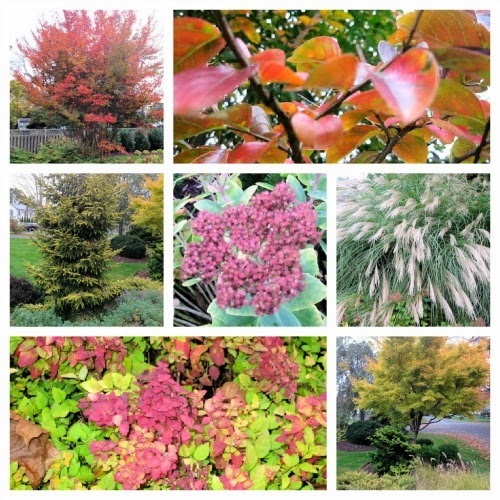 Winter is on its way but for now there is a beautiful display of bright pinks, oranges, golds and burgundy. We end the year with December and winter time is officially here. The garden goes to sleep until the longer days of spring arrive. Time will tell whether we get a blanket of snow this year that will cover the landscape. For now I will enjoy the evergreens which I have become to love. No matter what the time of year there is always something to look forward to in the garden. As Always...Happy Gardening and Happy New Year 2013!